When I read the Home Photo Studio I thought it meant lights and stuff not the processing side of things. You actually don't need much of a printer if you have your stuff printed. 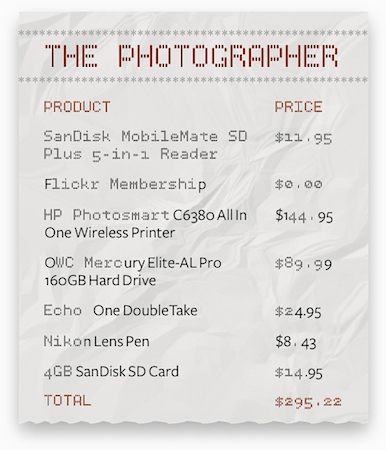 I'd sacrifice something on your list and add a copy of The Digital Photography Companion! I also use printing services, but I really like having the printer/scanner in the home office too, especially a 2-tray model that has 4x6 or 5x7 photo paper ready to go on a moment's notice. That being said, how could I ever argue with including the Digital Photography Companion?! Ditto on including the Digital Photography Companion. But I'd also find some way to include Pixelmator for an image editor capable of localized editing. For only $59, you get a lot of Photoshop-type capability. I'd at least include it if you were allowed to have the extra $300. I was really on the bubble about Pixelmator. On one hand, I thought it was terrific and had fun playing with it. But I wasn't sure how the general Macworld readership would respond to it. On hindsight, it would have been good for the second $300 list. Thanks for bringing it up here Doug. Not sure if I agree but I need to do some research on my own. Well written article for sure though. Three-month certificates of deposit were quoted at 4.35-4.50 per cent, while three-month commercial papers (CPs) were quoted at 4.80-5 per cent.